Whether your goal is to lose, gain or maintain, it all comes down to calories. A 1,700-calorie diet is a lower calorie plan that may help men and active women lose weight, and help inactive women 50 and over maintain weight. Because it's a lower calorie diet, make sure the plan includes a healthy mix of foods from all the food groups to ensure your essential nutrient needs are met. Consult your doctor or a dietitian to discuss specific calorie and diet needs before making any changes to your usual eating habits. To get the most nutrition out of every bite on your 1,700-calorie diet, include fruits, vegetables, whole grains, and low-fat or nonfat dairy foods in your meals. Round meals out with healthy sources of protein such as poultry, lean red meat, eggs, seafood and beans, along with healthy fats such as nuts, seeds and vegetable oils. Your diet plan should consist of three meals of about 500 calories each, and two 100-calorie snacks. Planning how much you're going to eat at each meal and snack and eating regularly throughout the day helps control hunger to make it easier for you to get to and maintain a healthy weight. Start each day right with a healthy and filling breakfast. For example, you might enjoy 1 cup of oatmeal made with 1 cup of nonfat milk or soy milk and topped with 10 chopped pecans and 1 cup of sliced strawberries. An omelet made with three eggs, 1/2 cup of sliced mushrooms and 1 ounce of low-fat cheese and served with a toasted whole-wheat English muffin also makes a good breakfast on your 1,700-calorie diet plan. If you're short on time for a sit-down breakfast, make a smoothie with 12 ounces of nonfat Greek yogurt blended with 3/4 cup of fresh blueberries, 1 cup of fresh mango and 1/4 of a fresh avocado. Focus on fiber-rich fruits, veggies and whole grains at lunch to stay satisfied all afternoon. Consider a colorful salad consisting of 2 cups of mixed greens, 1/2 cup of sliced cucumbers, 1/4 cup of sliced cherry tomatoes, 1/4 cup of shredded carrots, 1/4 cup of raisins, 12 chopped almonds, 1/2 cup of chickpeas and 2 tablespoons of low-fat salad dressing, served with a 6-ounce container of nonfat Greek yogurt. Two cups of minestrone soup with a whole-grain roll, 1 ounce of part-skim mozzarella string cheese, a small apple and 20 peanuts also makes a filling lunch. Another option for lunch on your 1,700-calorie diet includes a 6-inch pita stuffed with 3 ounces of turkey breast, 1 ounce of Swiss cheese, sliced tomato and lettuce, served with 1 cup carrot and celery sticks with 2 tablespoons of low-fat ranch dressing and a large orange. For a simple dinner on your low-calorie diet, toss 1 cup of cooked whole-wheat penne pasta with 2 cups of cooked mixed veggies such as broccoli, cauliflower and carrots, 3 ounces of peeled and cooked shrimp and 1/2 cup of tomato sauce. A bean burrito made with a 6-inch whole-wheat tortilla, 1/2 cup of pureed pinto beans, 1 ounce of pepper Jack cheese and served with 1/2 cup of brown rice and 1 cup of mixed greens topped with 2 tablespoons of low-fat dressing also makes a good option for dinner. 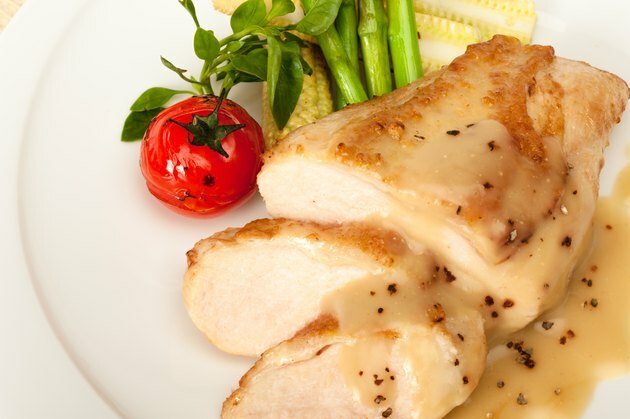 You might also enjoy 4 ounces of roasted chicken breast with 1 1/2 cups of roasted new potatoes and 2 cups of roasted asparagus. Be sure to pre-portion your snacks so you don't eat too many calories. Healthy 100-calorie snack options for your 1,700-calorie diet plan include 6 ounces of nonfat plain Greek yogurt, 10 pecan halves, 1/2 cup of whole-grain unsweetened cereal with 1/2 cup of nonfat milk, 2 cups of mixed greens topped with 2 tablespoons of low-fat salad dressing, a small apple with 1 teaspoon of peanut butter, 4 cups of plain air-popped popcorn or 1 1/2 cups of cubed cantaloupe.